"I have to get a man to fall in love with me." 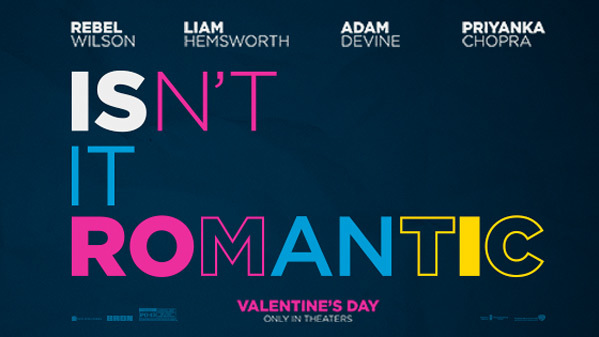 Warner Bros has released a fun first trailer for a new comedy coming out on Valentine's Day next year titled Isn't It Romantic, from director Todd Strauss-Schulson (of The Final Girls). This twist on romantic comedies stars Rebel Wilson as a woman who wakes up inside a romantic comedy world, where she's the star of every classic romantic comedy and she can't escape. It's a bit like that film They Came Together from a few years ago, mixed with Groundhog's Day, in a way. The trailer is pretty damn good, and I have a feeling this might be something really unique. This trailer gives us a full introduction to the setup, but I'm still curious to see more. Isn't It Romantic also stars Liam Hemsworth, Adam Devine, Priyanka Chopra, and Betty Gilpin. Just watch the trailer below and get a look at this. New York City architect Natalie (Rebel Wilson) works hard to get noticed at her job but is more likely to be asked to deliver coffee and bagels than to design the city's next skyscraper. And if things weren't bad enough, Natalie, a lifelong cynic when it comes to love, has an encounter with a mugger that renders her unconscious, waking to discover that her life has suddenly become her worst nightmare—a romantic comedy—and she is the leading lady. Isn't It Romantic is directed by American filmmaker Todd Strauss-Schulson, director of the films Private High Musical, A Very Harold & Kumar 3D Christmas, and The Final Girls previously. The screenplay is written by Erin Cardillo and Dana Fox & Katie Silberman; from a story by Erin Cardillo. Warner Bros will release Strauss-Schulson's Isn't It Romantic in theaters everywhere starting February 14th, 2019, on Valentine's Day, early next year. First impression? What do you think?